What differentiates Legacy Landscaping, Inc. is our integrated approach in which our Landscape Designer, Construction Manager, Project Manager, Irrigation, Landscape Lighting and Grading Professionals work as a team from the initial concept to implementation of each project. We welcome the opportunity to inspire you and create memorable landscapes and hardscapes, guided by a successful and dedicated team. 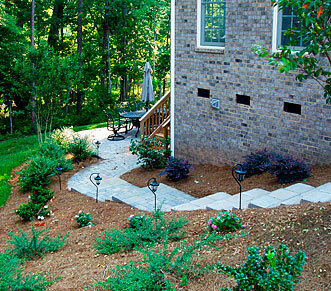 Our commitment to quality services has distinguished Legacy Landscaping, Inc. with our clients for the past 15 years. We collaborate with our clients to create landscapes that increase the use and quality of their landscape and outdoor living space. Also, Legacy Landscaping, Inc. is an Authorized Belgard Contractor. Becoming an Authorized Belgard Contractor entailed many hours of classroom instruction and on the job training. You, as the customer, will benefit because only Authorized Belgard Contractors can offer a 2 year craftmanship warranty, warranty on the materials for as long as you own your home and this warranty is backed by Belgard!